IELTS Academic and IELTS General - What are the differences? For university admission or professional qualification purposes, you must take the Academic IELTS exam. However, for visa and immigration purposes, IELTS General is sufficient. 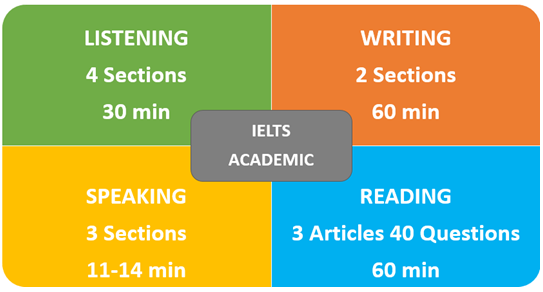 The exam formats of IELTS Academic and IELTS General do have some things in common; but there are differences and today we are going to focus solely on IELTS academic. This part is the same for Academic and General. You will listen to four recordings of native English speakers and then write your answers to a series of questions. The test gets more difficult as it progresses (i.e. part 1 is the easiest and part 4 the most difficult). Topics for Academic IELTS are of general interest to, and suitable for, test takers entering undergraduate and postgraduate studies or seeking professional registration. Whereas, the topics for IELTS General are of general interests. Task 1 - describe, summarise or explain the information in a graph, table, chart, map or diagram summarise or explain the information in your own words. Task 2 (40 minutes) - write an essay in response to a point of view, argument or problem. The Structure is the same for Academic and General, but the texts for General are slightly easier. This section includes three long texts which range from the descriptive and factual to the discursive and analytical. These are taken from books, journals, magazines and newspapers. They have been selected for a non-specialist audience but are appropriate for people entering university courses or seeking professional registration. This component is the same for General and Academic. The speaking component assesses your use of spoken English. Part 1 (4-5min) - general questions about yourself and a range of familiar topics, such as home, family, work, studies and interests. Part 2 (2min) - given a card which asks you to talk about a particular topic. You will have one minute to prepare before speaking for up to two minutes. The examiner will then ask one or two questions on the same topic. Part 3 (4-5min) - further questions about the topic in Part 2. These will give you the opportunity to discuss more abstract ideas and issues. You can improve your English by taking IELTS preparation lessons at SI-UK’s Language Centre in London and Manchester. Learn more by arranging a free consultation today and take a practice test to learn your current ability.